Harvest House resident Robby Nagel brought his beehives over today. Robby inherited the hives from his grandpa who retired from beekeeping a few years ago. 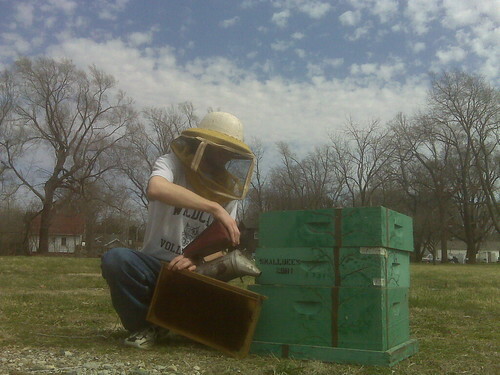 Robby has been going to beekeeping classes offered by the Central Eastern Illinois Beekeepers Association and approached us a few months ago about keeping bees in our big yard. We’re not only glad to share in the honey but the bees will function as excellent pollinators to our trees and crops. In the photo above, Robby is showing me how the different pieces of equipment work.